Driving home in a heavy rainstorm yesterday, we stopped in Manchester at The Vermont Butcher so we could just squirrel in with good books when we got home instead of making our weekly food-shopping trek. Among other meats, including the hard-to-find-around-here fresh chicken livers, we got a beautiful boneless heritage pork loin roast with a thick covering of creamy white fat. All of a sudden, the weather has changed. The temperature has dropped. The heat was on when I got out of bed this morning. The leaves have turned color and are falling at a rapid rate. We're sashaying into winter with an autumn cozy and beautiful enough to take our minds off what it will be like in February when the holidays are over, the ground is covered in snow, and the thermometer reads MINUS 14°F. I love summer. Who doesn't? And, as my friend Sharyn says, what passes faster than a summer? Nothing. But I am always happy on the first day I get out my gloves, look for my favorite sweater, and think it might be time to pull on a pair of tights. That day was two days ago, and my thoughts turned to a change in the kind of food I've been cooking for almost four months, which is why I was so happy last night to have that pork roast waiting to be cooked. When Tom makes his constantly-requested bone-in pork rib roast with the chine removed, he seasons it with Herbes de Provence and salt and pepper. That's it. Not even garlic. Since I didn't have a jar of Herbes de Provence, I looked up what that is and found the recipe on marthastewart.com. I didn't make a whole batch, just a pinch of each of the ingredients, going a little heavier on what I like best, leaving out lavender, an ingredient I didn't have. I took the pork roast out of the refrigerator, patted it dry, added my little Martha Stewart mixture, kosher salt, and black pepper, and let it sit for about an hour until it got to room temperature. I preheated the oven the 450°F, put a round cake rack in my 12-inch cast iron skillet, set the roast on it, and put it in the oven. When it was done and had rested for a few minutes, I had fabulous drippings, and juices, and glorious goo in the bottom of the skillet, which I used, after defatting, to bathe some homemade cavatelli. With some garlicky sautéed spinach, this dinner was a perfect beginning to the meals of autumn. This is my pared-down version of Mark Bittman's basic roast pork, Roast Pork with Garlic and Rosemary in How to Cook Everything, Revised Tenth Anniversary Edition. Note: The USA Guidelines for safe minimum internal temperature temperature, last modified on October 19, 2018 (which may have been updated since I am writing this, so double-check this information to be sure), state that beef, pork, veal, and lamb (steaks, chopped, roasts) and ham, fresh or smoked (uncooked) are safe to eat cooked to an internal temperature of 145°F with a three-minute resting time. 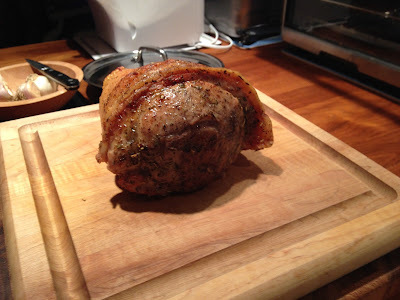 A 2-to3-pound boneless pork loin roast (not a pork tenderloin) Try to find one with a good cap of fat on it. Take the roast out of the refrigerator, dry it, pat on the Herbes de Provence, and add salt and pepper to taste. You want the roast to come to room temperature before you start to cook it. This will take about one hour. Put the roast on a rack in a pan. Place in the preheated oven, and cook for 15 minutes at 450°F. Open the oven door, and very carefully, watching out for steam, pour ½ cup of white wine or chicken broth over the roast. Reduce the heat to 325°F. Continue to cook at 325°F, checking every 15 minutes to see if the bottom of the pan is dry. If it is, add a little more liquid. 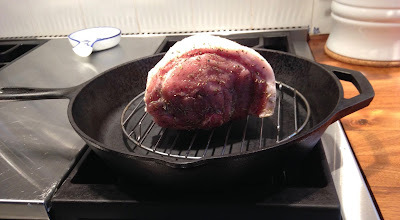 If the meat does not have a luxurious covering of fat on it, baste it. 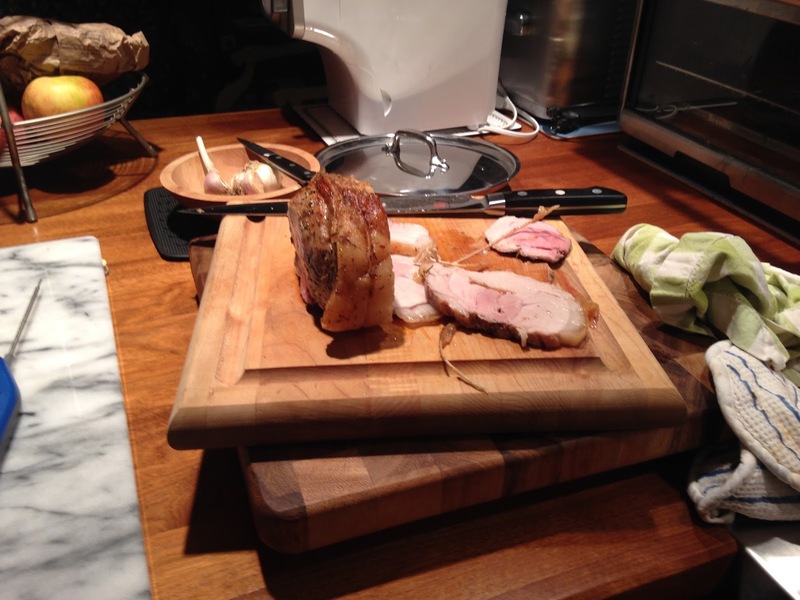 Depending on its size, the roast will take anywhere from 1¼ to 2 hours to reach an internal temperature of 145°F. To avoid overcooking, start checking it with an instant-read thermometer at 1¼ hours. I use a Thermapen. Once the meat reaches the right temperature, remove it from the oven, and let it rest for about ten minutes before carving into thin slices. You can use the pan juices to make a gravy with more of the wine or chicken broth if you like. To do this, remove the roast from the pan, place the pan on a burner on top of the stove over medium-high heat, and either reduce the juices in the pan to ¾ cup or add enough liquid to make ¾ cup. Stir to incorporate any drippings in the bottom of the pan, reduce the sauce to the thickness you like and, if you want to make it a little richer, stir in the optional tablespoon of butter. I usually find that the roast is so juicy, it doesn't need any gravy or jus at all.